To hear Boris Johnson, current Foreign Secretary of the United Kingdom, is to be subjected to the capsuled calls of another kingdom. That kingdom is often a past, where there was glory, and patriots could say they did it for England. Reality is emptied before you, and soothingly, one can bathe in the luminescence of an optimistic, entertaining bumbler who will front, but will never be able to do. His address at a packed Sydney Town Hall, organised by the Lowy Institute and chaired by Michael Fullilove, was delightful on a certain level. It furnished a reminder of how poor, in comparison, the Australian public speaker or political figure can be: dull, grasping for a humour packaged with canned laughter, lacking in curiosity and essentially staged. But Johnson’s audience was there to be entertained. He had top billing. His past stint in the antipodes was reflected upon as a cultural baptism that lingered. There were the conscious referents: “Stubbies daks – shorts of appalling brevity”; “bonzer, mate”, conveying a false familiarity from a person whose common ground with the egalitarian Australian “battler” is, in truth, non-existent. He did, however, try to woo, to speak seductively, and familiarly. Throughout his address, Johnson used the arresting language that convinced British voters on making the most significant decision in generations: leaving the European Union. It was a Tory voice directed at the disaffected, a conservative anarchism dressed up as a patriotic sense of worth before the pen pushers on the continent. His hook was a thought experiment: to convince his Sydney audience of how unfortunate it would have been had Australia suffered the fate of joining the EU. Imagine the difficulties, the problems, the costs. Australia could be seen as a model of a country that could thrive without being packed into a tense family of nations. 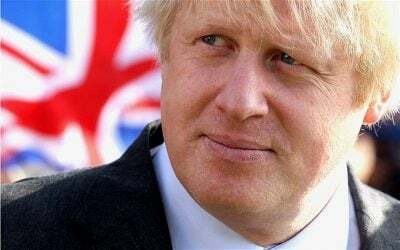 Apart from the incongruity of the comparison, Johnson was being devilish by omission, not least of all on the enormous advantages that being part of a common trading block had been to Britain, which had been, in the 1970s, an ailing patient on the European scene. There had also been improvements in accountability on the subject of human rights and welfare. What mattered to Johnson, instead, were the busybody intrusions of standards, diktats and directives issued from the unelected (ignoring, naturally, the role of the European Parliament) on whether a particular food might pass muster, or a certain construction accord to standard. Conveniently omitted were the oversights that have served the British commonweal, rather than undermine it. Joining ASEAN and such forums, he insisted, was far better than being part of a bloc of states governed by EU strictures. The club fees for the former, he surmised, were far cheaper. Besides, Britain wanted to, as Evelyn Waugh might have said, project its might, notably through the deployment of two aircraft carriers in the South China sea and through the Straits of Malacca. Well and good, but beyond the laughter was a grave seriousness. After the calisthenics comes the reality. First and foremost, nothing of significance has happened since last year’s referendum, other than Britain asserting its boisterous independence from those nasty little regulators in Brussels, Strasbourg and Luxembourg. Another tangible result has been the critical weakening of the Tory government. Britain’s Prime Minister, Theresa May, foolishly made the decision to burden the British electorate with yet another ballot, hoping to bury Jeremy Corbyn and the Labour opposition. The result was a richly deserved mauling and hung parliament. Johnson’s efforts at drawing the veil over his boss’s doomed prime ministership were enchanting, though far from convincing. The Boris narrative would have you believe that Britain has the negotiators (it does not, certainly not those skilled in EU matters); that it has the teams, the means to ensure that nothing, in effect, would really change to the disadvantage of the UK. Stating a line made more in optimism than sober analysis, the EU stood to loose going hard on Britannia. Boris would also have you believe that those aircraft carriers actually existed, yet these, he had to concede, had yet to be constructed. London had the world’s greatest financial centre, despite the fact that companies have been looking elsewhere to park their centres. The English speakers were, let’s face it, supremely gifted, even if only monolingual – forget those vast cosmopolitan empires of a rather different nature that populate the historical record. This was Boris Johnson to a tee: promises made of considering fatuity, if not irrelevance. After leaving “the EU, I am confident that Australia will be at, or near, the font of the queue for a new Free Trade Agreement with Britain.” Such spellbinding pluck: the UK barely in the process of hammering out its own negotiations on divorce, let alone having a plan for Brexit, and its foreign secretary speaking of queues. Nothing if not entertaining.